What does it mean to be Weruva Grade? 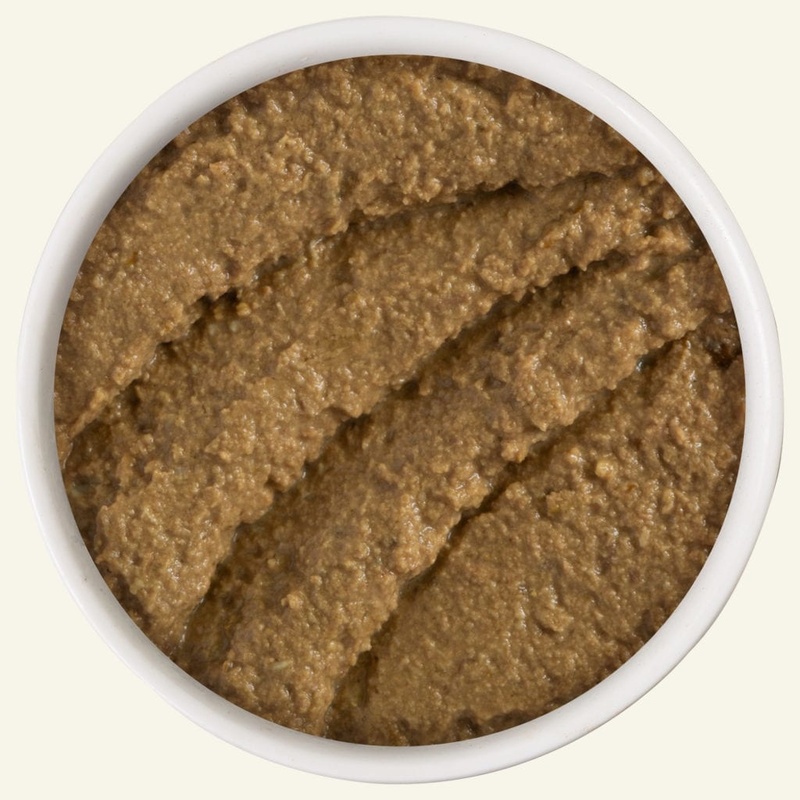 It means we feed your precious pets like we feed ourselves and our pets: with dishes made by hand, with ingredients and cuts you recognize when you see them, with recipes dialed-in for feline- and canine-specific dietary needs, and crafted in accordance with the strictest standards. It’s time to PLAY… for dinner!? That’s right, new B.F.F. Paté Lovers Aw Yeah! recipes are what your best feline friend has been asking for. 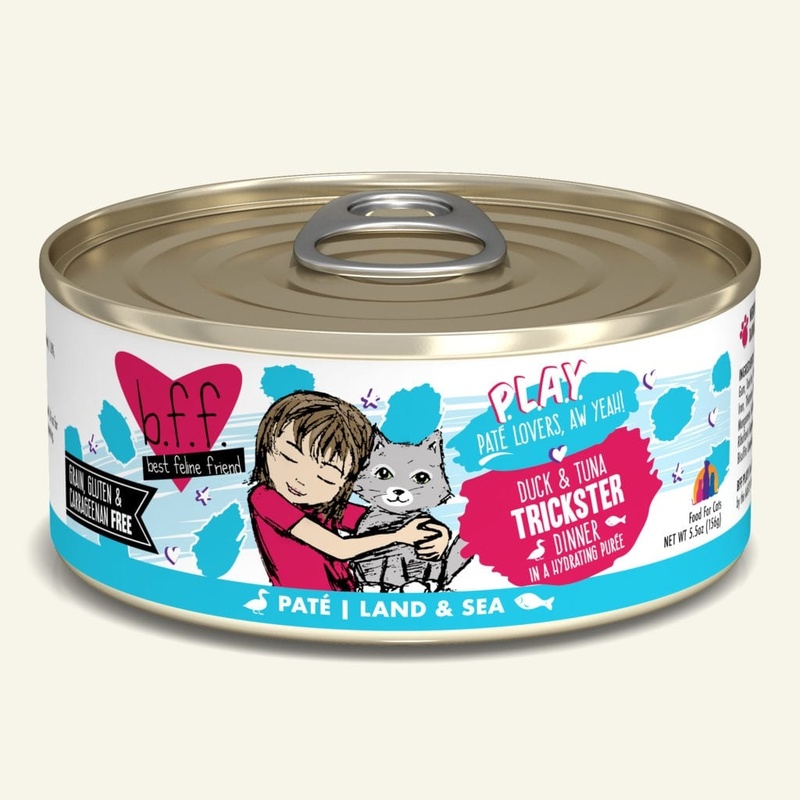 Grain, gluten, carrageenan, and starch free means that these playful patés are sure to please even the pickiest of pals. 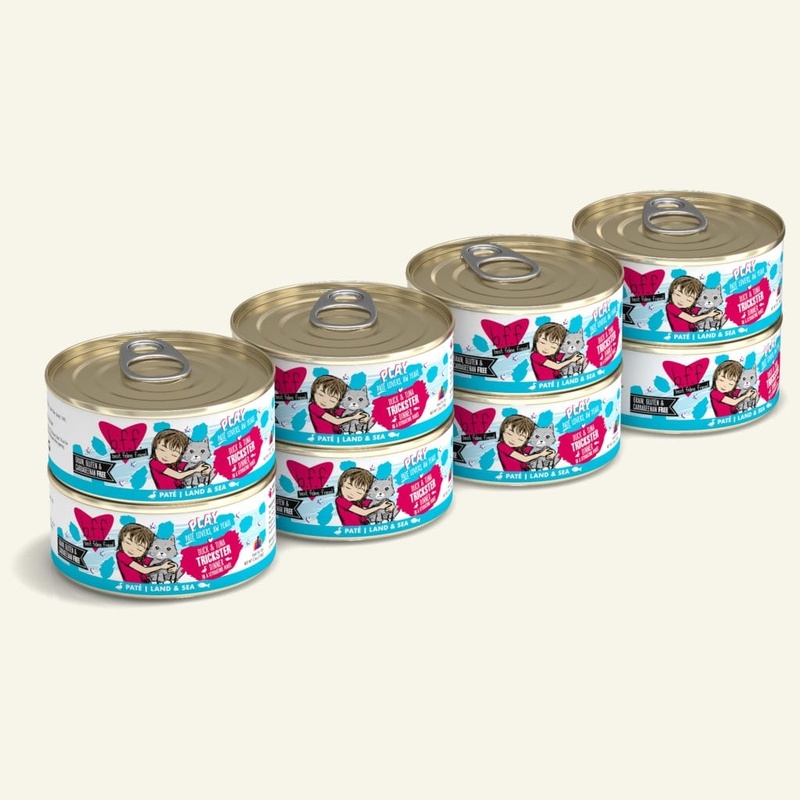 Available in cans and pouches in three protein options; chicken only, fish only, and mixed protein recipes. 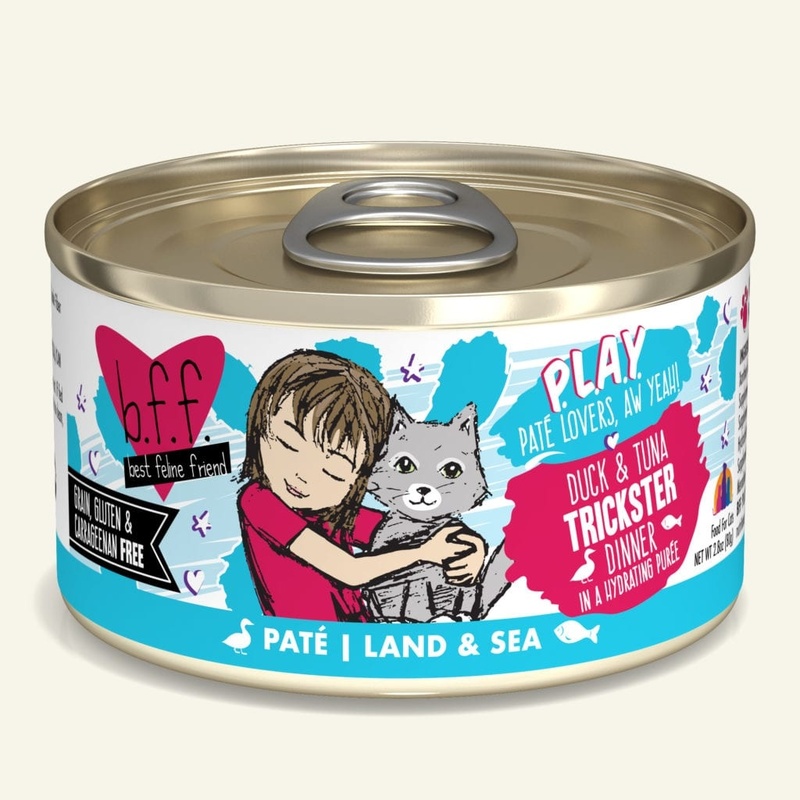 Whether or not your cat is tricking you into feeding them this fluffy, duck and tuna paté, you’ll be happy knowing that they’re eating a hydrating meal full of flavor! Cats generally require around 200-250 calories per day, and this largely correlates with 1oz per pound of bodyweight per day total (best fed not at one time) …But mostly, it comes down to trial and error. We do not believe in counting calories for cats as there really is no correct caloric amount. Unlike many dogs, cats that are eating the right foods will more or less know when it is time to stop eating…the key being that they are eating the right foods…and that would be food with high quality protein and fat. Calories can come from 3 sources: protein, fat and carbohydrates. Cats are “obligate carnivores” which means they require or are “obligated” to eat meat. The calories that come from meat are protein based and fat based, with minimal if any calories coming from carbohydrates. Therefore, cats need protein and fat, they do not need carbs. For cats (and dogs), carbohydrates are not metabolically necessary. Foods should therefore have a meat-based focused with the vast majority of calories coming from protein and fat with minimal to no calories coming from carbs. Dry kibble, for instance, cannot be made without carbs…one of the reasons we do not manufacture one for felines, nor do we recommend feeding one. We generally state that as long as your “obligate carnivore” kitty is eating high quality protein (such as animal based meaty cuts), he or she will likely not overeat. Cats eating foods with carbohydrates (such as dry kibble) or foods with inferior protein sources, such as plant-based proteins like wheat gluten or corn gluten, may tend to overeat or may not get proper nutrition.